The sander runs at 12,000 orbits per minute with 1.1 amps of power, which provides an efficient work. The sander is equipped with the filtered Dust Collection to keep work area clean, ideal for indoor sanding work. Packed with 12 pcs sandpapers(6 Pcs X 80 & 6 Pcs x 180 Grits), you can use the sander to meet your different sanding needs, saving money. Soft rubber covered handle is comfortable for single hand control and reduce your fatigue. The machine works stably with low vibration, low noise, ideal for daily DIY sanding work. 2M(6.5Ft) power cord provides your sanding work without restrictions. It supports to polish for precision jobs. 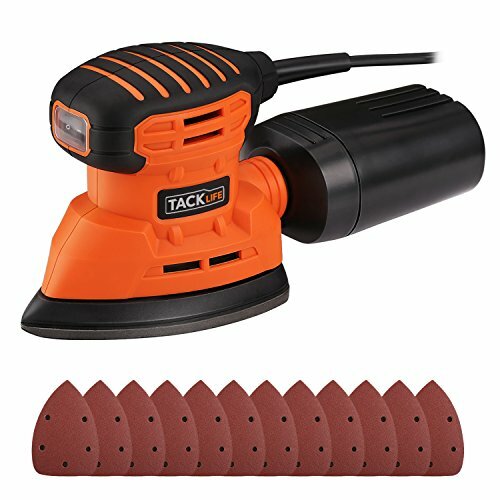 ▲【Efficiency】 The sander runs at 12,000 orbits per minute with 1.1amps of power; 140X140X80mm(5-1/2x5-1/2x3-3/20inches) sanding pad with 2mm working pendulum diameter to support high efficiency. ▲【12Pcs Sandpaper】 with 12Pcs Sandpaper(6Pcs X80 & 6Pcs x 180 Grits) lasts the sander a long using life and meet your different applications of removing paint from wood, metal, or plastic of corners and other hard-to-reach areas. ▲【High Performance Dust Collection】 With a dust Collection can keep the work area clean. The buckle connection design keeps the box from falling off during work, it is an ideal tool for indoor detail works. ▲【Dust-resistant Switch】 The dust-proof switch keeps the switch clean and lasts a long service time, the switch also can be locked after activated or closed to reduced the hand control. ▲【Ergonomic Design】 Hand-held parts are rounded and covered with soft rubber provides comfortable for prolonged sanding. Small size for easy one-handed operation.